Is he not perhaps a designated marksman rather a SF operator? The knee pads and thigh holster make me think not. The blue body armour makes me think he is. Knee pads and thigh holsters are not exclusive to SF. But i have not seen SF wear blue body armour. All so these guys are not sf but infantry. Same set up. Not sure what that link is about? Those guys could still be SF, note they are all wearing something to cover their face. Could be that they are wearing blue because they are in amongst regular forces and so don't want to be mistaken for rebels or to otherwise blend in. Maybe but knee pads are not SF only. All so i know that the border patrols have a R1 so regular infantry use them and that there is a DM course open to any one. So fancy gear and a nice R1 does not mean SF. All so provat gear is a opstion. I use my own personal stuff on occasion. Yep. Can just make out the SA flag on the tailboom. German Documentary with some cool footage of SA Troops and the SAAF. 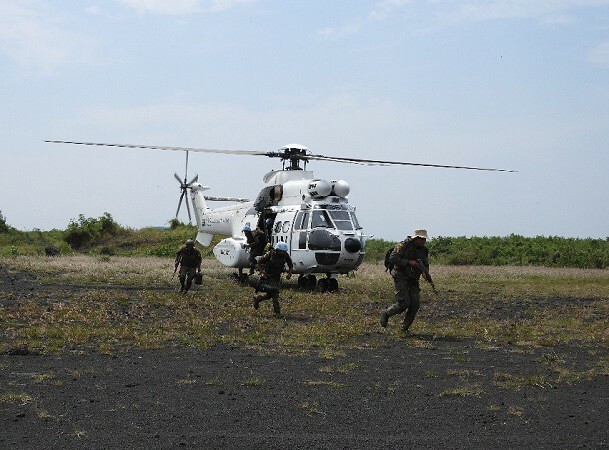 Sake, North Kivu Province, DR Congo: Guatemala Special Forces (GUASFOR) conducting training in fast-roping for future aircraft operations. Fast-roping is a technique for descending a thick rope. It is useful for deploying troops from a helicopter in places where the helicopter itself cannot touch down. Photo MONUSCO/Force. On 3 September a South African patrol was ambushed by unknown forces in Ngadi, near Beni, DRC. The attackers, possibly ADF members, damaged one SANDF Mamba armoured vehicle and wounded two soldiers. In addition, during a separate incident, a SAAF Oryx helicopter was hit by ground fire. With damaged rotor blades, the pilot was able to navigate out of the area and land at a nearby airstrip. 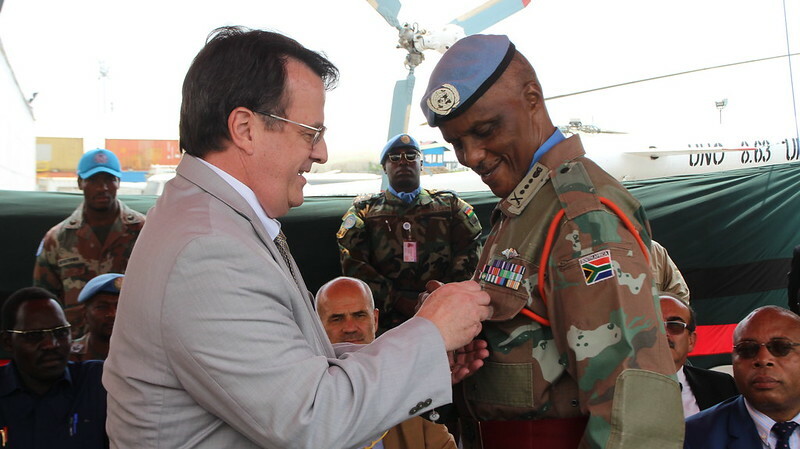 While the brazen nature of the attack may seem uncharacteristic of a UN peacekeeping mission, the South African contingent within the Force Intervention Brigade (FIB) of MONUSCO is a uniquely aggressive one and encounters regular attacks. As such, when the patrol came under attack with small arms and RPG fire, their ability to recover the damaged Mamba, extract the wounded, and fight their way out is indicative of a good level of discipline under fire. But yes, RSABATT, MALBATT and TZBATT are coming under increasing attack from ADF and Mai Mai forces in the Beni region, with some indications of there being a desire to repeat the success of the attack against COB Semuliki. The SANDF troops appear to be handling the situation well though.